"An alternative to Mozilla Firefox and Internet Explorer based on the same engine." Avant Browser is an interesting alternative to the two most popular browsers on Windows: Internet Explorer and Mozilla Firefox. It is based on the Internet Explorer engine, what provides sure compatibility with the majority of web pages. As additional options it includes anti-ads filter and the blocking of pop-up pages, tabs browsing. Apart from that, each time we start the browser it lets us recover all the pages that had been opened before closing the browser and also begin using it from the Start page. Concerning the security, it is important to point out the ability of deactivating the elements like ActiveX, scripts and Java applets. It can also deactivate other kind of elements like images, sounds, flash animations, videos and so on for speeding up browsing. It’s one of the browsers with the best optimisation when we talk about the use of the RAM memory, as it uses very few of it and lets for higher performance without saturating the systems with poor RAM. Moreover, each tab functions in an independent process avoiding the problems produced by any general web malfunction. Apart from the integrated memory liberator it will leave free all the RAM used by a tab until we close it. 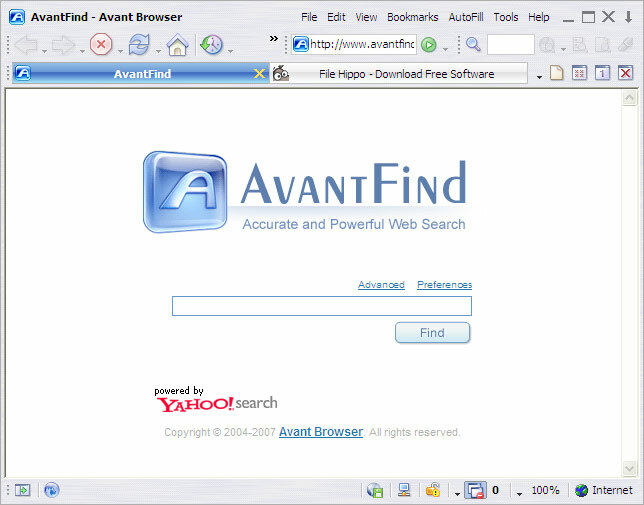 Avant Browser other features include an integrated downloads accelerator or a video download system that lets downloading YouTube videos that are being detected automatically. It also has a favourites’ sinc service, mouse movements support, pop-up windows’ blocker, partial view for being able to use it simultaneously with other applications. In short, its a little known browser but it has a big variety of features of the famous ones just in one single product.